Check Out our EMV Certification Services - Deltec Consulting, Inc.
About Deltec Consulting (www.deltecconsulting.com) – Deltec Consulting has a long track record of experience working in the payments industry with Amex, Discover, MasterCard and Visa. Deltec Consulting helps stakeholders in achieving their migration to contact and contactless EMV in a fast, cost effective and efficient process. 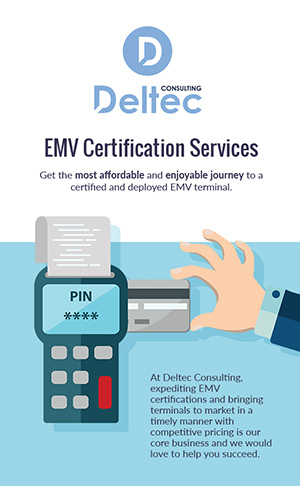 With its proven EMV experience and Card Brands’ accreditations, Deltec Consulting assists Merchants, ISVs, VARs, Gateways, Processors and Acquirers with their EMV Level 3 debugging, pre-certification and formal certifications phases. Tags : EMV Level 3, Faster EMV, Quick Chip.